Portlandia, starring Fred Armisen (of Saturday Night Live) and Carrie Brownstein (a former guitarist of the now defunct, Portland-based girlpunk band Sleater-Kinney), takes aim at an amazing array of topics surprisingly heretofore untouched — all within the parameters of the gloriously flaky Oregon city. The pair portrays almost all main sketch characters, from the frumpy earth mother proprietors of a feminist book store called Women & Women First to the team captain and star player of Portland’s own competitive hide and seek team. Along the way a host of impressive cameos pop up, including Steve Buscemi, Aubrey Plaza, Jason Sudekis, Aimee Mann, Gus Van Sant and Decemberists frontman Colin Meloy. 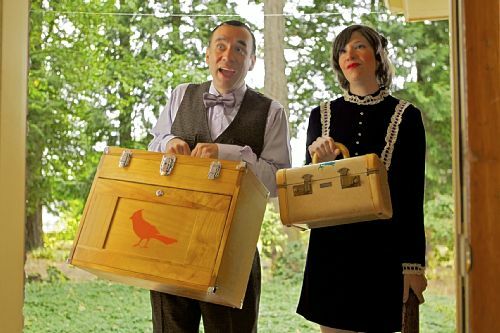 In the interest of full disclosure, it took me an episode to really gel with Portlandia. On the surface it seems like a fairly specific target for jokes, yet upon peeling back the layers one discovers the characters parodied are those found in niche pockets in any city’s town. As it were, by mid-second episode, I’d grown a remarkable affinity for the proceedings. Brownstein and Armisen are great choices for Portlandia’s leads, Brownstein herself being a prior real-life Portland alt-rocker and Armisen finally feeling let off the SNL leash to pursue the absurd pieces we see him hint at on Saturday nights at NBC. The earnestness with which they infuse each character is as much a valentine as a mockery, and Brownstein and Armisen keep things subtle and dry — which is not only the right way to play this style of broad comedy but serves both leads’ sensibilities well. It’s unbelievably ridiculous — like the Portland artist duo whose main contribution to art is to “put a bird” on things or overly-empathetic diners who insist upon visiting the farm where their free range chicken was raised to make sure it was a positive environment — and the entire project has the feel of an indie film itself. Portlandia is an ideal property for a channel like IFC, which has a built-in audience and demographic one would assume gets such jokes, and it fits well with current late-night IFC offerings like Mr. Show and The Larry Sanders Show. IFC has dabbled in sketch before with the painfully spotty Whitest Kids U Know, but Portlandia, with recognizable anchors and a relatively untouched wealth of stereotype with which to have fun, is a worthy look and has already been renewed for a second season (the first, in the middle of its run now, is only six episodes). It’s a hipper-than-thou sketch show, but it’s hipper-than-thou-ness is the entire joke. If Portland is indeed where the nineties still lives, and Armisen and Brownstein can continue to harness that into such inspired comedy, I’ll be happy to visit weekly. Portlandia airs at IFC on Fridays at 10:30 pm.